621 Salon is a series of events hosted by 621 Gallery the third Thursday of every month. 621 Salon strives to become a place for younger, upcoming writers to begin reading their own work and putting it out for the public’s ear. While their audiences continue to grow month to month, they are always looking for new writers and audience members to strengthen and expand their goal to support, promote, and encourage these new artists. 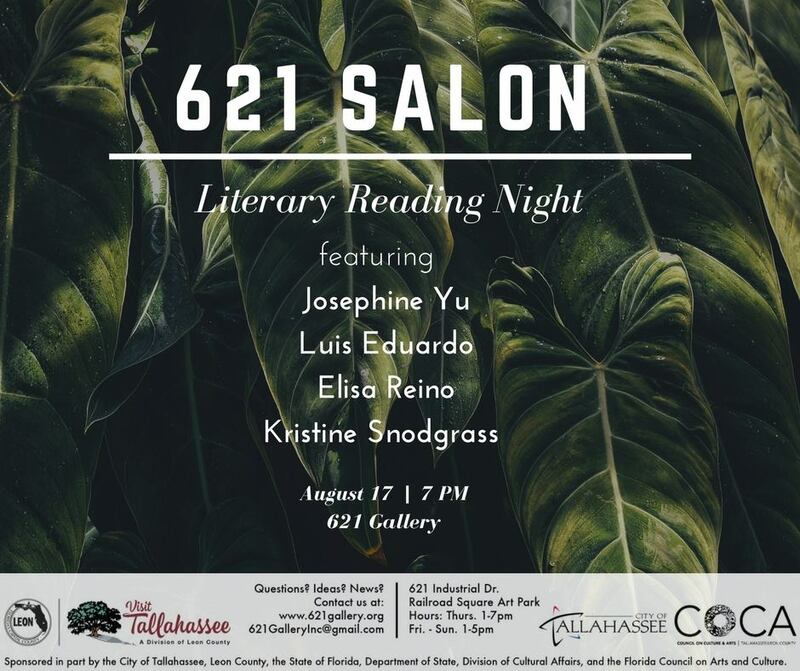 Come support local writers by attending 621 Salon Thursday, August 17th, from 7-8 PM. The Salon will feature the literary works of Josephine Yu, Luis Eduardo, Kristine Snodgrass, and Elisa Reino. Josephine Yu is the author of Prayer Book of the Anxious (Elixir P, 2016). Winner of the 15th Annual Elixir Press Poetry Awards, the Ploughshares 2013 Emerging Writers Contest, Meridian’s 2010 Editor’s Prize, the New Letters 2010 Poetry Award, and the New Letters 2010–2011 Readers Award for Poetry, Josephine’s work has appeared in The Southern Review, Ploughshares, 32 Poems, and other journals. Luis Eduardo is a poet and musician from South Florida. He is currently working on creating a band and collaborating with other artists. Elisa Reino is from Fort Lauderdale with Cuban and Costa Rican roots. She is a poet who recently graduated from FSU with a degree in Creative Writing and is excited to begin teaching 4th/5th grade in the fall. Kristine Snodgrass is the author of chapbooks and books, most recently OUT OF THE WORLD (Hysterical Books 2016). She is Co-director of Anhinga Press and an Associate Professor at Florida A&M University where she teaches poetry and writing. Refreshments will be available for a small donation.